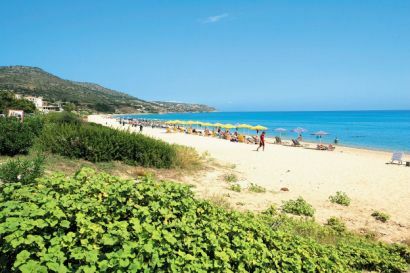 Skala is Kefalonia’s most popular resort and one that has developed from a small fishing village to a modern and fun resort in just twenty years. Yet it has done so without ruining what made it inviting in the first place and has thankfully not gone down the ‘loud and brash’ route of many other Greek Island resorts. 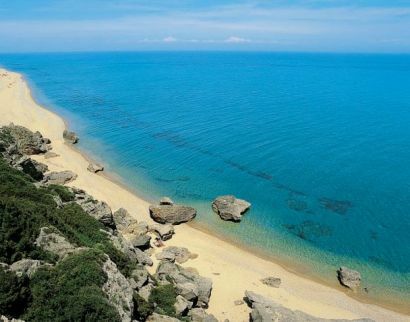 However, that’s not to say it doesn’t offer all the usual Greek Holiday resort conveniences and attractions. 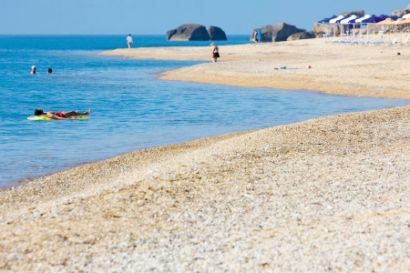 Skala is a proper resort destination now and offers everything you would expect from lively bars and the occasional nightclub through to miles and miles of fantastic blue flagged beaches of both sand and shingle, all surrounded by gorgeous sweet smelling and impossibly high pine trees. 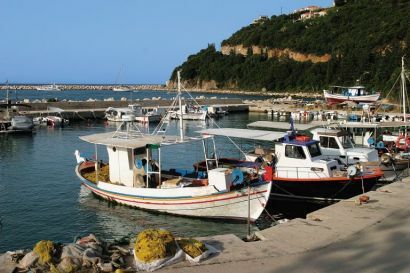 When it comes to fun and attractions Skala has something for everyone. On the beach you’ll find a choice of activities ranging from extreme sports – jet skiing, paragliding etc – through to relaxations aimed at the more horizontally inclined – sun loungers, umbrellas and drinks with umbrellas, all served up on your own little corner of the beach. Skala may be popular but it is quiet enough that you can get a spot on the beach all to yourself and not worry about barging shoulders with people lying next to you. In the resort itself there is everything you need, mostly on the main street, from supermarkets and gift shops, cash points, banks and pharmacies to bakeries, local food and craft markets to a wide array of different tavernas and bars (from small and friendly local tavernas to larger tourist bars with music and dancing). Additionally, if you fancy a gentle stroll around a quieter area then you can head over to the original fishing village which is a charming and friendly place to visit. You can lose hours wandering around the maze of narrow cobblestoned streets amongst the houses, cafes, tavernas (with locals sat outside playing cards) and fishing huts. Though still picturesque the modern village was rebuilt in 1956 after the earthquake destroyed almost all of the original village. If you fancy a break from the resort it is worth exploring some of the history dotted around Skala. For example you can find a 3rd century ancient Roman villa on the edge of the village which is free to visit and definitely worth seeing, if only for the stunning well-preserved mosaics. Similarly if you head a couple of miles out of town you’ll find the remains of the Temple of Apollo which archaeologists have dated back to 600 BC. Lastly, up in the hills there are numerous ruins for the original Skala village. For many years it was possible to stroll around these remains and ruins and picture what life used to be like and thought this is still possible a few of the sites have since been bought by developers and new villas are starting to spring up. 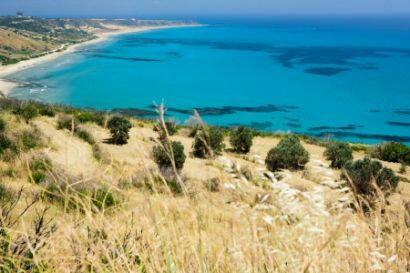 Nevertheless it is worth going there if only to see the old churches, houses and olive presses and the wild goats and other wildlife living there. Another escape from the beach resort, should you decide you need one, is to head out into the fields and hills around Skala where you can wander amongst the goats and sheep running free and the thousands of local beehives which are used to make an amazing Kefalonian thyme flavored honey. 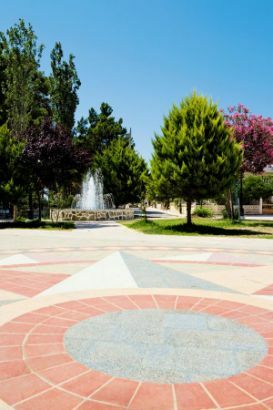 There are numerous trails that wind through the valleys and hills and between smallholdings and vineyards, olive and orange groves and endless rows of fig trees, walnut trees and almond trees. 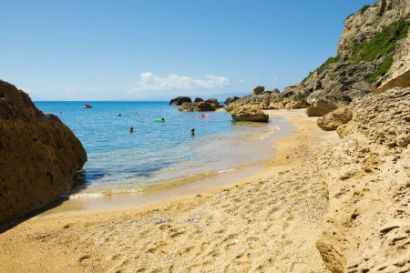 Finally there is Potamaki beach, just down the coast, which is recently been declared a conservation area thanks to the extremely rare loggerhead turtles laying their eggs there. 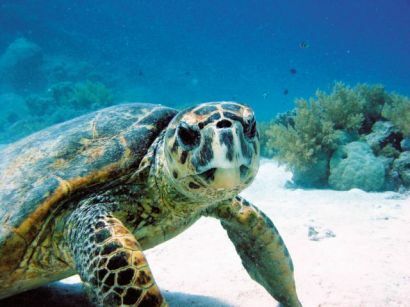 Take the opportunity to go on one of the turtle watches at night – it is something you will never forget.